QWED has continued efforts on extending availability and functionality of the QuickWave software for electromagnetic design as well as the scope of its applications. We are pleased to announce that the newest QuickWave 2017 has been released. The most visible change in QuickWave 2017 is the Ribbon GUI that appears in the QuickWave Editor and in QuickWave Simulator. All commands in the Ribbon are organised in a series of tabs divided in sections with grouped commands and contain various types of buttons and controls. QuickWave Editor is equipped in the main Ribbon containing all commands needed for creating complete project for FDTD electromagnetic simulation with QuickWave Simulator. QuickWave Simulator is equipped with the main Ribbon and window dedicated Ribbons containing all commands needed for running electromagnetic simulation, checking the FDTD mesh, observing the electromagnetic fields and components and getting the simulation results. For the convenience of the users, we kept the possibility of using the previous Toolbars style. The choice can be made during the first run of QuickWave Editor and QuickWave Simulator or later with the use of readily accessible commands from the menu. All main menus and windows� menus in QuickWave Editor and in QuickWave Simulator were organised thematically, what provide easy access to options and commands. The new QuickWave Help system provides easier and faster access to the specific topics. 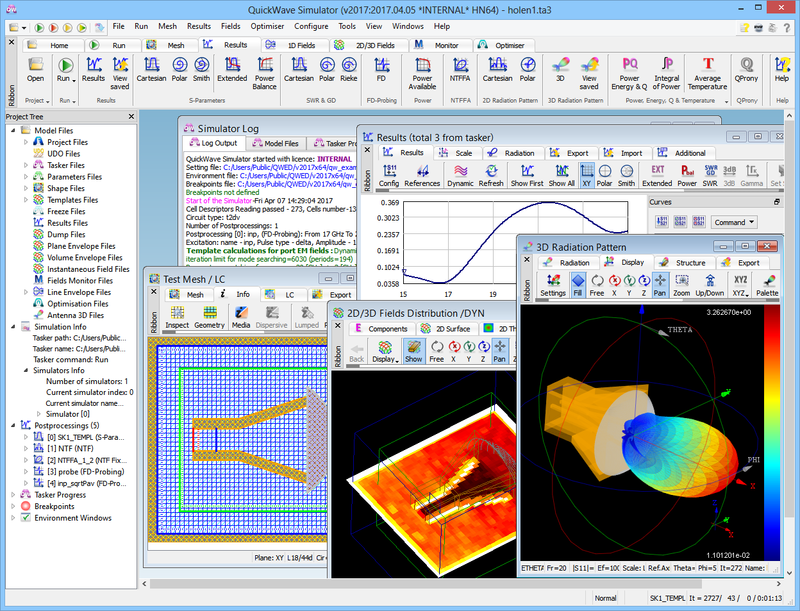 The QuickWave Help system is divided into subcategories and is available from every window and dialog of QuickWave Editor and QuickWave Simulator. The Basic Heating Module is now enhanced with a wide variety of options, allowing defining complete BHM process directly from QuickWave Editor interface, which include intuitive configuration of Rotation Axes, Movement Trajectories, declaring variable heating steps etc. The effective and practically useful solution for simulation convergence monitoring has been introduced. It utilises monitoring of the electromagnetic (EM) energy in the calculation model and stopping the simulation when it decays to a certain level. This allows reducing the number of performed FDTD iterations and as a result the computing time, without reducing a computational accuracy. This solution is now available in QuickWave as Energy Stop Criterion feature.